This schematic details NASA's next spaceship Orion, which will be built by contractor Lockheed Martin. The piecesare coming together for NASA's next spaceship Orionas space agency engineers begin working with lead contractor Lockheed Martin toshape the vehicle's cockpit. "We'rebringing the design teams together and looking at the features of this so thatwe can adjust and have one integrated concept," NASA's Orion project managerCaris 'Skip' Hatfield told SPACE.com this month, adding that astronautsare key in the design process. "We don't want to deliver them a cockpit andhave them hate it." The Orioncockpit is just one of many features under review by NASA and Lockheedengineers as the agency discusses the requirements necessary for thecapsule-based spacecraft, which is expected to begin manned flights to the International SpaceStation (ISS) in 2014 and return astronauts to theMoon by no later than 2020. Engineers areusing a Lockheed Orion mock-up, along with a NASA-built counterpartat the agency's Johnson Space Center, to set out a definitive design for thepost-shuttle era spacecraft. The contractor then opened a mock-up of the spacecraftto reporters at its Houston-based Exploration Development Laboratory thismonth. "This is along way from ready-to-cut metal," NASA astronaut Lee Morin, who is helping to developthe avionics and crew systems for Orion vehicles, said in an interview. "But it'sa very important step in that direction." NASA tapped Lockheedto build the solar-powered Orion vehicle on Aug. 31. The spacecraft is designedto succeed NASA's three spaceshuttles - Discovery,Atlantisand Endeavour- which are set to be retired by September 2010. While theOrion vehicles owes much of its capsule look to NASA's Apollo vehicles, whichcarried astronauts to the Moon and Skylab space station during the late 1960sand early 1970s, its updated interior and avionics will bring the designsquarely into the 21st century. "The Apollowasn't really in the computer age," Cleon Lacefield, Lockheed's Orion programmanager, told SPACE.com during a tour of a spacecraft mock-up. "We aregoing to have smart [computer screens] and there will be a keyboard in between,and from that you can receive all the information you need. So you don't haveto have a zillion and one switches." With adiameter of about 16.5 feet (five meters), Orioncapsules are expected to have about 2.5 times the habitable volume of theirApollo predecessors, with all primary systems routed through a fold-out panelof touch screens that swings into place above the pilot and commander seatslocated beneath the primary windows. "It's goingto be a lot larger than Apollo," Lacefield said. "The whole idea is to maximizevolume." At leasttwo more windows, one to either side of the pilot and commander seats, and onehatch portal are planned for Lockheed's current Orion design. Like NASA'sApollo vehicles, the entry hatch is mounted to Orion's side while a dockingtunnel - for either the ISS or lunar vehicles - opens at the top. Two launcharrangements - a six-seater for ISS-bound flights and four-person array forlunar missions - are on the drawing board, with the seats themselves made up offoldable metal frames connected by sturdy webbing. "Theseseats are designed so that if you lost two of the four parachutes duringlanding, the crew is secure," Lacefield said, adding that the seats are alsodesigned to keep astronauts safe should their capsule tip over to one sideafter touchdown. "There's a lot of capability in these seats." Lacefieldsaid that storage space will line the floor - on Earth - of Orion in the formof a wall of lockers, while the area directly opposite of the main windows isreserved for electronics, life support and computer equipment. The rest of thewalls, he added, are expected to be usable free space. Meanwhile,Morin and his fellow astronauts have been working to best identify exactly whatkey systems Orion crews will need to operate, the best shape for windows and otherfeatures. "We made itour business to go out and see as many cockpits as we could," Morin said,adding that astronauts examined the flight decks of the military's F-22jet fighter, the massive Airbus A380aircraft, as well as commercial and business jets. "We aren't missing somegood technologies and some good ideas." The goal,Morin said, is to establish a fundamental philosophy for astronaut controlsaboard Orion that can then be transferred to futurelunar-bound spacecraft. "We'relooking at trying to have as flexible a system as we can," Morin said. "And wecertainly have it in the back of our minds, of how we can use this experiencefor future vehicles." 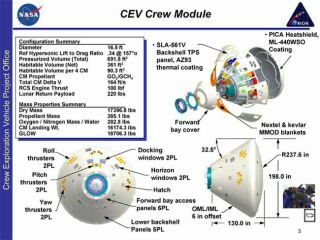 One of thekey departures from NASA's past crewed spacecraft - ISS notwithstanding - is theaddition of two solar wings to power Orion's service module, which will housemost of the vehicle's systems and main engine. NASA's Apollo capsules relied onfuel cells, which also power space shuttle systems in orbit today. "It adds adifferent set of things you've got to pay attention to," Hatfield said, addingthat the solar panels must work every time. "You want to get up to orbit anddeploy those arrays right away otherwise you have to turn around and come homebecause you have no power." NASA alsoawarded a $14 million contract toHuntington Beach, California's Boeing Co. this month to develop the vital ablativeheat shields that will protect Orion vehicles as they reenter the Earth'satmosphere at speeds of 16,700 miles per hour (26,876 kilometer perhour) from the ISS, and up to 25,000 miles per hour (40,233 kilometersper hour) on a return trip from the Moon. Thecontract includes plans for heat shield samples, designs, a full-scale demonstrationunit and a series of detailed studies to evaluate the proprietary phenolic impregnated carbon ablator (PICA) mixture manufactured byBoeing's Maine-based subcontractor Fiber Materials, Inc.
Hatfieldsaid there are still many other components of NASA's renewed lunar exploration programthat are still yet to be awarded to contractors, among them: planned lunarhabitats, rovers, rocket stages and engines. "Nowthat we're all together, it's just amazing," Hatfield said. "It's just great tosee the excitement and enthusiasm."